The way this big creature blended with its environment was unnerving. Here is a land iguana whose yellow highlights, I was told, came from eating the yellow cactus flowers. While not naturally partial to reptiles with their rough scales and silent ways, I did think the yellow on its face and limbs gave this one a friendly look. It seemed to grin and had an easy gait. The iguana noticed me but wasn’t all that curious about me. If it had been singing, I’ll bet Zip-a-Dee-Doo-Dah would have been its song. This photo is from the Galapagos Islands. 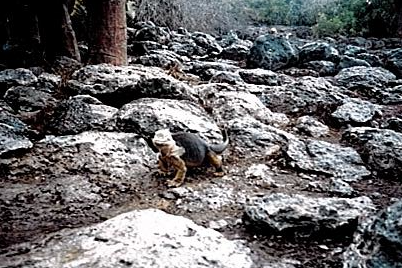 More information and pictures of the yellow land iguana can be found at Wikipedia.